Leostar Muhurat software helps to obtain accurate Muhurats as per your convenience. Leostar Muhurat software simplifies the job of Muhurat calculations. Leostar shubh Muhurat software not only gives auspicious day but also auspicious time of that day. It incorporates auspicious Muhurats for - Marriage, House warming, Service, Medical, New Born Child, Love & Romance, Property & Business, Industrial Establishment, Money matters, Speculation, Court, Vehicle, Election, Journey and Education etc. Apart from Muhurat calculations and predictions it also contains comprehensive and complete astrology solutions required by an astrologer for making predictions in its Astrology module i.e. planet aspect, Bhava aspect, cusp aspect, Saptvargas, Shodash Vargas, Varga Bhedas, Vimsopaka, Satvargas, Shodash Vargas, Varga Bhedas, Vimsopaka, Karaka, Avastha, Rashmi, Nakshatra Reading, Mahadasha and Antardasha analysis and Transit predictions for next 30 years, More than 500 astrological combinations, transits till 9999, the combinations and remedial measures for inauspicious Yogas like Manglik dosh, Kaalsarpa Yoga and Sadesati etc. have also been given in detail. Leostar helps to obtain accurate Muhurats as per your convenience. With the help of this software one can quickly & easily get accurate Muhurat related to any work at any place in this world. By using this software you shall escape from extensive calculations and in the process abstain from committing errors in calculations. In addition, you do not require keeping regional Panchang. Accurate Muhurat for carrying a special task in any part of the world can be obtained in seconds. Enter that time only for which you require Muhurat. For complete accuracy the calculation of Tithi, Vaar, Nakshatra, Yoga and Karan is considered. In addition to that rising, combustion, retrogression and direct motion of planets and movable, fixed and dual Lagnas etc are also considered. The auspicious and inauspicious yogas formed during that period are also analyzed fully. 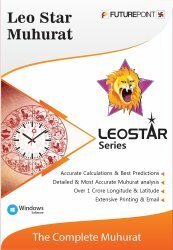 Leostar not only gives auspicious day but also auspicious time of that day. It divides Muhurat into 4 categories depending upon the order of auspiciousness of the Muhurat from high to low. It grades these categories in grades like A, A++, B and B+ etc. It also shows the percentage wise auspiciousness of Muhurat. If you do not wish to use one specific feature you can make that choice inactive. For example if you do not need the option of combustion of planets then it can be turned off. The modules that one gets in Leostar Muhurat software are Teva, Astrology, Muhurat, Tables & Mundane. KP System, KP Significator, Shodasvarga Tables, Upgraha, Sannadi Chakra etc. are included.